Click here to see a BSL version of the blog presented by Zoë. As you may have seen in the earlier blogpost in March 2016, members of the Centre for Translation & Interpreting Studies Scotland at Heriot-Watt University (Jemina Napier and Robert Skinner) are working in collaboration with researchers from the Social Research with Deaf People (SORD) group at the University of Manchester (Alys Young and Rosemary Oram) on an 18-month interdisciplinary project funded through the Arts & Humanities Research Council (AHRC) Translating Cultures Research Innovation Grant. Information about the project can be found here, and a summary of the project presented in BSL by Jemina Napier and Rosemary Oram as part of the EdSign lecture series can be seen here. As mentioned in the March blogpost, the AHRC is keen to support the capacity building of young researchers, so Zoë McWhinney began her 20 day research internship with Heriot-Watt University at the beginning of June 2016 – spending two weeks on campus at Heriot-Watt University and then will be carrying out the rest of her internship by distance until the end of the project in October 2016. Zoë was involved in supporting the final Stakeholder Advisory Group meeting in June 2016, and is involved in various tasks for the remainder of the project (including drafting and translating this blogpost!). Our research focuses on what it is like for Deaf sign language users to be known largely through translation. The Deaf experience of being constantly interpreted is markedly in contrast to the general hearing population’s experience, even that of other linguistic and ethnic minorities. This experience often leads to an asymmetry of the ‘power dynamics’ and consequently the opportunities available to Deaf person in non-signing, hearing- dominated spaces. Some Deaf people’s well being may be adversely affected by the stresses created in such a situation – an area of exploration in this research project. 3 Deaf BSL users who choose to speak sometimes in their professional work contexts participated in face-to-face interviews in BSL. We have coined the term ‘Deaf Contextual Speakers’ to explain how these Deaf BSL users sometimes use speech, even though they identify as BSL users. 2 x Community Participatory Groups were held in BSL with Deaf community members (7 in total). Each of the 2 sessions lasted for 2.5 to 3 hours and also had some activities to allow space for open discussions. The participants in this group were most responsive when watching and commenting on clips of scenarios with examples of Deaf and hearing people’s communication being interpreted by an interpreter. 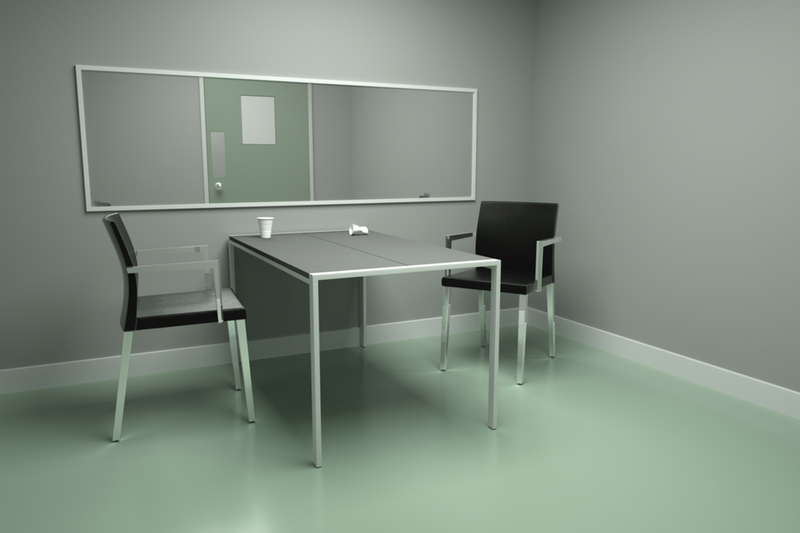 5 x simulated recall interviews were held with Deaf professionals in BSL after one of the research team had filmed them in a real situation with interpreters. Originally we had planned to test the use of Think-Aloud Protocol (TAP) as a methodology (where people comment on what they are seeing while they are doing a task), but due to the complex circumstances and the reality of the participants being BSL users accompanied by interpreters in person, we adapted the approach to a ‘simulated recall (SR) interview’. The SR interviews involved participants being shown a video of themselves interacting with hearing persons via an interpreter and asking them questions about their experience of being interpreted based on what they could see in the video. All the focus groups and interviews were semi-structured, with the participants given example questions and/ or topic outline beforehand. Time length for focus groups took from 1.5 to 3 hours, whilst the individual interviews took from 30 minutes to 1 hour each. The research study gained full ethical approval from the Universities of Manchester and Heriot Watt. Presently, the team is conducting an in-depth qualitative analysis using both a thematic analysis approach and a critical inquiry methodology. The findings will be published in a range of academic journals related to social research, deaf studies and interpreting studies, as well as present at different conferences and community events. BSL access to the main findings will be made available online as well. For example, we presented some preliminary findings in a poster session at the 8th Critical Link International Conference on Community Interpreting between 29th June to 1st July 2016 at Heriot-Watt university; and will also be presenting a more detailed overview of results at the Association of Sign Language Interpreters UK Conference in Newcastle in September 2016. On 7th June we had our third and final meeting with the Stakeholder Advisory Group (SAG) in Edinburgh, Scotland, with representatives from the British Deaf Association (Scotland), the Scottish Association of Sign Language Interpreters (SASLI) and Action on Hearing Loss (Scotland), where we presented the preliminary results from our analysis of the data. The role of the SAG has been to give the research team guidance on the research methods, data collection, recruitment of participants, interpretation of the results, and also about potential implications of the research, and we would like to thank all the people who have attended meetings throughout the project, including other representatives from Deaf Action in Edinburgh and Deaf Connections in Glasgow. One of the final recommendations from the last SAG meeting was for the project team to hold a roadshow to present the results of the project to members of the Deaf community in BSL. We will look for funding to enable us to do that. The research team are now working with AC2.Com Productions and Mutt & Jeff Pictures to develop scripts for 3 short video dramas in BSL in order to illustrate some of the key findings from the research project. We plan to disseminate the videos through various platforms, including social media. As well as working on the video production, Zoë will be assisting the research team to organise a dissemination event in September, where the whole team will present final results from the project and launch the videos. The event will be hosted in collaboration with our partner Action Deafness at their new venue at the Royal School for the Deaf in Derby – so look out for future announcements! This article was originally published in The Conversation by Jemina Napier, Professor and Chair of Intercultural Communication, Heriot-Watt University. Jemina Napier has received co-funding for JUSTISIGNS through the European Commission’s Leonardo Da Vinci Lifelong Learning programme, and from the UK arts and humanities research council. We all have occasions when we need to deal with the police. Perhaps your car has been stolen and you have to report it; or perhaps you have witnessed a mugging and you have been called to the police station to be interviewed and provide a witness statement. Or perhaps you have been accused of shoplifting and the security guard has detained you in the back room until the police arrive. Interacting with the police can be stressful, regardless of whether you are a witness, a victim or a culprit. Most of us have one very useful advantage, however: we can hear. Anyone who is deaf and has dealt with the police may have found communication a major problem. Too often, the forces in the UK and elsewhere in Europe struggle to provide sign language interpreters at short notice or even to understand the needs of deaf people. It hampers their access to justice and needs to be addressed urgently. The first thing to make clear is that we are talking about quite a substantial number of people. The European Union of the Deaf estimates there are approximately a million deaf sign language users in Europe. In the UK, there are estimated to be approximately 70,000 deaf people who use British Sign Language as their first or preferred language. This is a linguistic and cultural minority group with its own accepted norms of behaviour. And most people probably don’t realise that deaf people use different sign languages in every country around the world. They identify one another on that basis in the same way that a British person might identify a German or Spaniard through the way they talk. When it comes to the justice system as a whole, deaf people’s right to interpreters has increasingly been recognised – even if this is typically enshrined in disability discrimination law rather than laws to protect cultural minorities. But while there are now established systems for providing interpreters in courts and tribunals, and clear guidelines on booking them for police interviews and solicitor consultations in the UK and some other countries across Europe, researchers have repeatedly found that deaf people encounter barriers. The issues are often to do with people in the justice system not being aware of the need to book interpreters to ensure that deaf people can communicate. This can usually be resolved in time for court cases or for courses in prison, but what happens in police encounters at short notice? There are reports of police misreading a deaf person’s attempts to communicate. On some occasions, deaf people have had to wait many hours before an interpreter can be found and they can be interviewed by police. There are recurring cases of people giving witness statements without an interpreter (or with an unqualified person). The statement is then admitted as evidence in court, and the deaf person doesn’t understand the process they have been involved in or the consequences of signing the statement. As the police interview is the first point of contact in a legal process, it is essential that people understand their rights and the process. This can’t happen for deaf people if they don’t have a professional qualified interpreter in the interview. To better understand the problem in police settings and address the barriers, I have been collaborating with a team of international specialists for the past three years. The JUSTISIGNS project includes seven universities and sign language professional bodies from the UK, Switzerland, Belgium and Ireland. There is a lack of established legal terminology in British Sign Language and other sign languages. On the back of this evidence, JUSTISIGNS held masterclasses and training workshops for police officers and interpreters in the partner countries; and events and meetings to inform deaf people and other relevant organisations and professionals of the project. In the UK, it helped develop best practice guidelines on legal interpreting and worked with Police Scotland on a British Sign Language translation of the Scottish law caution and an explanation of what it means. The hope is that in years to come, deaf people will be able to deal with the police in unexpected situations without any disadvantage. That is certainly what they are entitled to expect. While we were all busy teaching, marking papers, setting exams, attending conferences and writing papers, Dr Raquel de Pedro Ricoy spent part of the first semester in the jungle. Literally. Raquel is working on an AHRC-funded project entitled “Translating Cultures and the Mediation of Indigenous Rights in Peru” with Prof. Rosaleen Howard (Newcastle University) and Dr Luis Andrade (Pontificia Universidad Católica del Perú), in partnership with the Directorate for Indigenous Languages of the Ministry of Culture and the rural development agency SER. The project looks at new state-sponsored initiatives to facilitate better communication between the Spanish-speaking majority and speakers of the many Amerindian languages of the Andean highlands and the Amazon basin. The aim of the project is to research how far translation and interpreting, in contexts of mediation between the Peruvian state and its indigenous populations, can achieve the state legislated goals of upholding indigenous rights, while also sustainably developing the resource-rich territories where the indigenous populations live Ever since the Spanish conquest, Peru’s indigenous languages have lost ground to Spanish, which dominates all fields of formal communication and is seen as having greater prestige than the local Amerindian tongues. Indigenous people often suffer discrimination on linguistic as well as sociocultural grounds. However, this situation is gradually being reversed. Languages such as Quechua and Aymara in the highlands, and Asháninka and Shipibo in the rainforest, are spoken in schools and health centres, and bilingual indigenous people are becoming trained professionals in a variety of fields. Laws passed in 2011 make translation and interpretation a right, and the government is responding by translating the laws into the native languages as well as training bilingual indigenous people to be interpreters. This is why Raquel spent two weeks in the high jungle town of Quillabamba,where the Ministry of Culture was running a training course for speakers of indigenous languages. As part of the project, Raquel and the rest of the teamobserved the training sessions, contributed to a panel on language rights and ran a workshop with the participants on the experience of translation. The trainees were speakers of: Matsigenga, an Arawak language; Harakbut a highly endangered language spoken by just 2,800 people in Madre de Dios department; and five different varieties of the Andean language Quechua. Raquel subsequently travelled to Pucallpa, in the Peruvian western jungle, where she interviewed community leaders who had used the services of interpreters in a consultation process facilitated by the Ministry of Transport and Communications. During her stay in Lima, Raquel delivered a plenary lecture at the XII International FIT Forum and joined government representatives and legal experts for a round-table discussion on legal translation and interpreting for indigenous languages. The team is currently working on an article about the indigenous experience of translating indigenous rights law, involving translators in the difficult task of expressing western concepts such as ´rights´ and ´law´ in their own Amazonian and Andean tongues. EU study on Public Service Translation in Cross-Border Healthcare is out! After 10 months of non-stop work, we are delighted to announce that an EU study on Public Service Translation in Cross Border Healthcare, led by Prof Claudia V. Angelelli is published. The Report, commissioned by the Directorate-General for Translation, responds to an increasing interest in the role of language provision and information access in cross-border healthcare. Linguistic diversity permeates every thread of the European Union fabric. Cross-border healthcare is increasing among EU citizens and residents who seek care under Directive 2011/24/EU or Regulation (EC) N° 883/2004. In a multilingual and intercultural society like the EU, patients and providers may not share a language. If patients cannot access healthcare services in a language they fully understand, equal access to safe and high-quality healthcare is not guaranteed. Through the use of both quantitative and qualitative methods, this exploratory study examines language policies as well as responses provided (or lack thereof) to linguistically diverse patients in areas of Germany, Greece, Italy, Spain and the United Kingdom. The cost of language provision as well as good practices are also studied. Results show that a variety of responses, ranging from professional translation and interpreting support to informal and unprofessional ad-hoc solutions, are used to address the language needs of patients. In the absence of formal language guidance in EU legislation, in most observed cases appropriate language services are not provided for patients who do not speak the language of the Member State in which they seek healthcare. This study has implications for policy makers, healthcare providers, educators, translators and interpreters serving the needs of linguistically and culturally diverse patients. 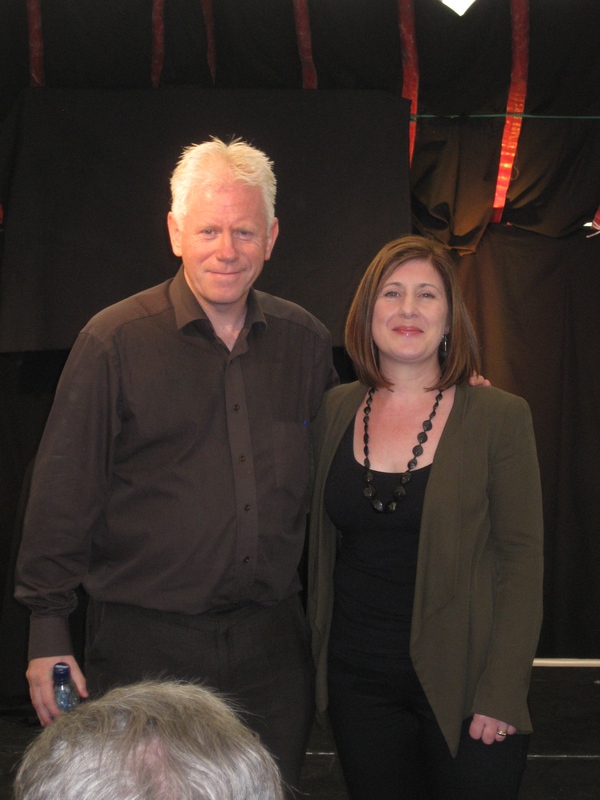 On Saturday 8th August, Jemina Napier and Noel O’Connell engaged in a heated debate on “Hearing Loss or Deaf Gain?” at the Cabaret of Dangerous Ideas. We’ve asked two members of LINCS, Heather Mole, a PhD student who is part of the BSL team, and Olwyn Alexander, Director of Academic English, to review the show. 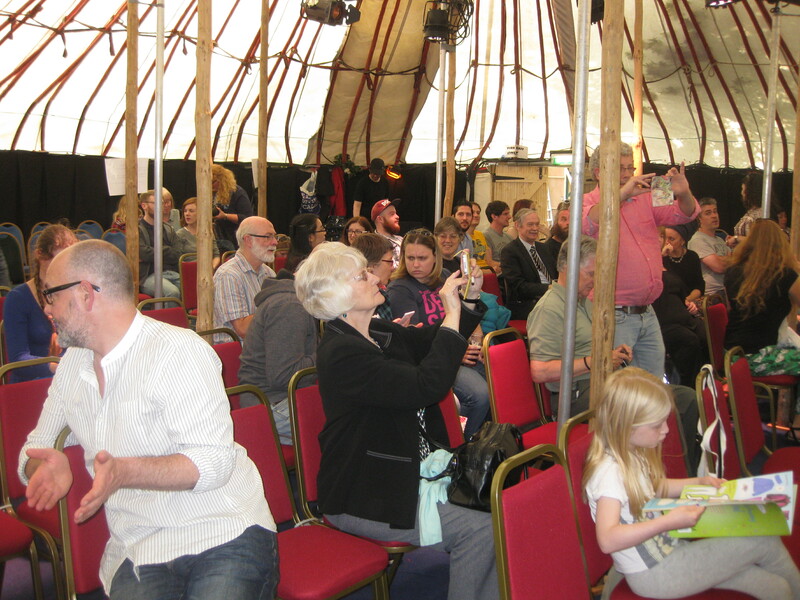 Heather Mole writes: At Edinburgh’s Fringe Festival, in St. Andrew’s Square, there is a yurt where dangerous ideas, backed by research, are being debated and discussed, thanks to the Beltane Public Engagement Network. For the third year in a row now Heriot Watt’s BSL team have picked topics of interest from Deaf Studies. This year the issue up for debate was “Hearing Loss or Deaf Gain?” Researchers Jemina Napier and Noel O’Connell took on the challenge of engaging the audience and trying to convince them that either the definition ‘hearing loss’ was sufficient for deaf people, or perhaps the term ‘Deaf gain’ would be a better alternative. Susan Morrison, our compere for the afternoon took on the role of a Martian (dressed in a woolly hat with a third eye) who wanted to find out from Earth people what this ‘deafness’ thing was and which definition the Martian’s would decide to use themselves – should she go with the positive gain of being Deaf, or the negativity of a definition which involves ‘loss’? With an audience of over 50 people, Jemina (hearing) and Noel (Deaf) took to the floor. They covered various issues during their debate including: Sound, Danger, Access, Communication and Visuality. Most hearing people think that not being able to hear people’s voices, or the calming, emotive or exciting impact that music has is a loss and a disadvantage in life. Noel pointed out that deaf people can enjoy music through vibration through the feet and body if they choose to, and that they have the benefit of being able to stand next to the speakers at a concert without any difficulty or concern for their hearing! It became clear that sign language users also benefit from being able to talk without losing their voices in this type of environment too (even though strobe lighting might make them look a little robotic). Next up was Jemina’s concern that deaf people could be in danger because they cannot hear alarms, or children crying, for example. But this was easily combatted by Noel as he explained that with strobe or vibrating alarms and child monitors there really isn’t any difficulty for deaf people to be alerted to the same dangers or concerns. And additionally it was a benefit to be able to sleep through unwanted noise, like noisy neighbours, freight trains or sirens. Something I’m pretty jealous of right now, living under a flat that hosts festival goers throughout August. At this point, Jemina realised she needed to up her game! So she brought up the issue of access to announcements, at train stations, or in airports. Surely this was hearing loss, a disadvantage of deafness. Noel reminded her that due to new technologies and apps, plus visual information being more and more available on public transport, this really wasn’t as much of an issue as she had imagined. And at this juncture we learned that the reason texting has become so popular and so widely available across different networks (something that was restricted in the early days of mobile phones) was thanks to the deaf community campaigning. So that certainly gave the argument for Deaf Gain an extra point! The discussion moved on to communication and the fact that deaf people need sign language interpreters to communicate which must be a loss in terms of their freedom to access everything they want. Noel agreed that this could be frustrating at times, but there is an additional benefit to using a sign language. Imagine going abroad on your holiday? If you don’t speak any other languages apart from English, you may have difficulty making yourself understood. He explained that because of the visual and iconic nature of sign languages signers are able, through gesture and visuality, to make themselves understood and create a pidgin language very easily. In fact there is a phenomenon known as International Sign Language which is in essence a pidgin and it’s used at conferences and between signers from different countries. Jemina, subverting her own argument, gave the example of the Deaflympics (the Deaf Olympics, separate from the Paralympics) where rather than seeing the teams sticking to their country groupings were mixing and using International Sign to communicate. Finally, they turned their attention to the visuality of deaf people. Noel gave us the example of how deaf people can communicate over distances and through windows without difficulty, something hearing people cannot. Jemina countered that though signing is so useful over distances if everyone signed then nothing would be private. But we were informed of the benefits of being able to sign under water (by Jemina again) and how in one situation two signers were diving and one panicked, but the other person was able to calm them down using sign language. If it had been a non-signing person the crude and basic gestures for ‘up’ and ‘down’ would have had little effect. Jemina, at this point, was hammering nails into her own coffin…. the audience were clearly finding the arguments for Deaf Gain pretty convincing. Susan took the microphone and offered the floor to the audience to make sure they had a chance to ask their questions. The audience were very obliging and gave countless examples of Deaf Gain :- reestablishing a friendship through train windows, the nature of Sign Language which allows the expression of concepts that spoken language cannot, the invention of the wing mirror by a deaf person (Arthur James Wilson), the benefits of babysign, cheaper car insurance for deaf people because they are less distracted (! ), better napping for deaf people (!) 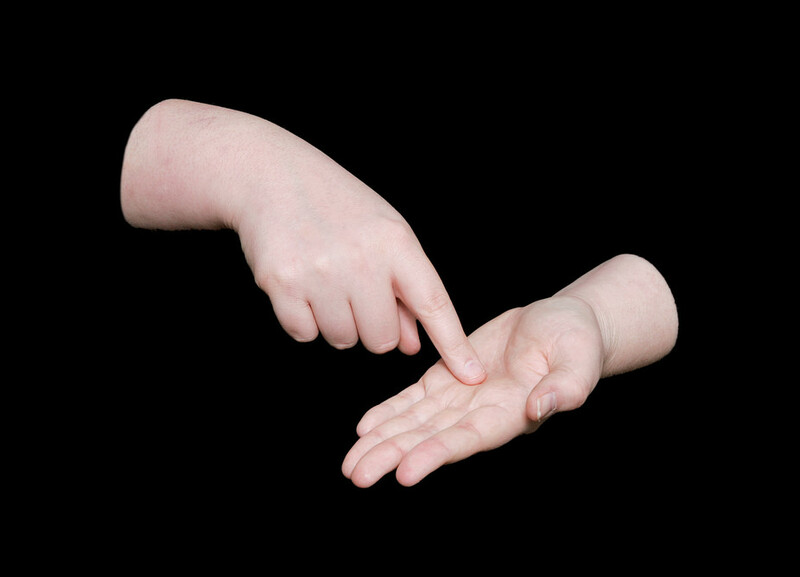 and due to the energetic nature of sign language the health benefits (losing the bingo-wings)! Not to mention ‘sniper-heckling’ from one young member of the audience who was secretly signing her comments to the presenters. I could go on….. It was acknowledged during the question period that if a person was born deaf they would not ‘miss’ hearing music or spoken language because they had never heard it. However for people who are losing their hearing or have become hard of hearing later in life there are of course challenges and a sense of grief in losing the ability to communicate easily or enjoy the music they once did. At the end of questions and comments Susan-the-Martian asked the audience to vote – hearing loss or Deaf Gain? You can probably tell which way it went. 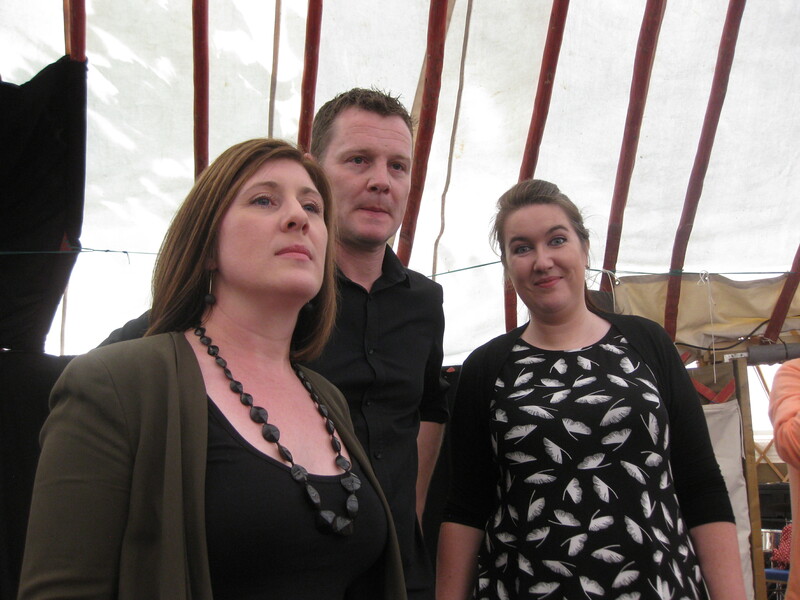 It was, though, perhaps a surprise that only one person voted for ‘hearing loss’ in the entire yurt. So who’s going to write to the Oxford English Dictionary and let them know that ‘hearing loss’ has fallen out of usage and submit the new description of Deaf Gain? For an article about the academic concept of Deaf Gain by H-Dirksen L. Bauman, Ph.D., and Joseph M. Murray, Ph.D follow this link. Or for a facebook site dedicated to ideas about Deaf Gain go here. 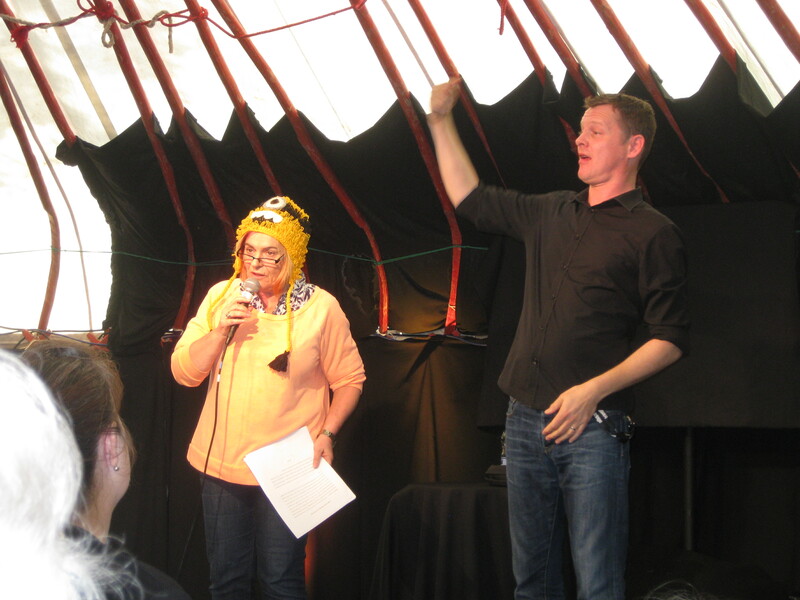 Olwyn Alexander writes: The Cabaret of Dangerous Ideas is part of the Beltane Engagement Network, which aims to make academic research accessible to a wide variety of audiences. On Saturday 8th August LINCS colleagues Jemina Napier and Noel O’Connell held a light-hearted debate on attitudes to deafness under the title Hearing Loss or Deaf Gain. It was clear from the beginning that the audience comprised many from the deaf community as the visual cacophony before the show started was… er, deafening! 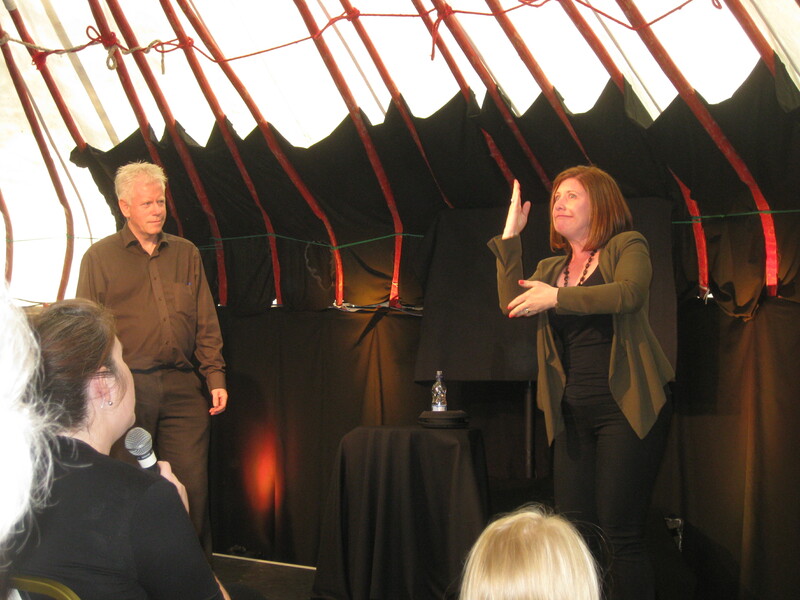 The debate proceeded through a series of themes, such as sound, danger, access, communication, which enabled Jemina and Noel to tell witty stories about the benefits of signing if not the benefits of being deaf. Jemina initially took the Devil’s Advocate position, challenging Noel to explain how he could appreciate music, listen to announcements on trains and planes or know when a fire alarm was sounding. Noel responded by explaining how he could appreciate music through vibrations and could stand right next to the speakers in a crowded bar or disco while speaking to a friend at the same time. Jemina countered with a very funny jerky display of how a signer might jumble a message on account of strobe lighting in the disco. The two debaters then told more funny stories about their experiences of being able to communicate with friends across noisy streets or between trains passing one another or through the windows of cafés or even under water, before handing over to the audience to ask questions and tell their own stories. Members of the audience got up on stage to sign their stories and one even performed a little magic turn by pointing to a couple of women in the audience to tell them that one was called Fiona and they had met each other in Stirling. Gasps of admiration all round until he explained that he had “eye-dropped” (cf eavesdropped) on them as they were waiting in the queue for tickets. I certainly learned some things I didn’t know before, for example about how visual and three-dimensional signing is and how signers’ peripheral vision becomes immensely sharpened so they are able to take in fast moving signals more quickly than hearing folk. I was also impressed at how much signing is a whole-body performance in a way that speaking isn’t and how much confidence that gave deaf people to stand up on a stage and tell their stories in very witty ways. I laughed a lot and would recommend everyone to take in other sign language shows – definitely a great way to start my Festival going. 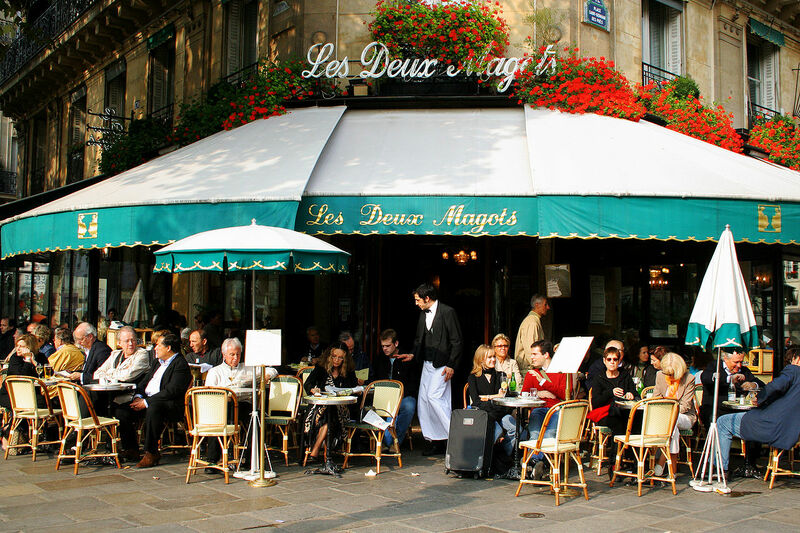 A café. Once a dedicated space where people gathered to discuss culture and politics. A space of arguing, debating, learning. A space where public opinion was formed and authority was challenged, contested, or at least influenced. A public sphere: a communicative space where people gathered to talk about public matters – politics. Their aim – to form public opinion and to influence government. Today, public spheres have evolved into more complex, more sophisticated spaces but also equally more diffuse and more informal. Think of online platforms such as blogs, twitter, facebook. A public sphere does not have to be a physical space waiting to be used, as these online platforms have proved. Instead, public spheres are spaces of communication that emerge with communication and die out when communication stops, when there is nothing left to debate. Also, nowadays people are constantly bombarded with information and opinions, they have become more knowledgeable, but also more passionate about certain economic and political issues. Political debates are not a privilege of the elite anymore. Again, think of online platforms such as blogs, twitter, facebook. Think of public squares such as Tahrir square during the Arab spring, Syntagma square during the Greek financial crisis, or Taksim square during the demonstrations in Turkey in 2013. Anyone can join the debate, anyone can make themselves heard, anyone can influence public opinion – right??? In order to participate in online public spheres, for instance, you need to have access to a computer and an internet connection. With this prerequisite, we’ve already narrowed down participation by about half (and having access to technology doesn’t mean you can use it)… But that has always been the case. In ancient public spheres, for example, such as the Forum in Rome or the Agora in Athens, only a tiny proportion of citizens actually participated in the debate. Only free-born male landowners and citizens of Rome or Athens, so no women, no foreigners, no slaves. Fast-forward to the 18th – 19th centuries and the situation hasn’t really changed. An eminent German philosopher with the name Jürgen Habermas writes that the public spheres of that time, such as coffeehouses and salons were composed of male citizens who had property in their name. These people communicated – allegedly – through the public use of reason. So there has always been some form of gatekeeping – be it gender, financial status, nationality. Today most of these barriers are not relevant anymore, but there is one that still persists : language. It’s funny, language, be it spoken or signed, is at the heart of communication and yet multilingualism seems to be largely ignored in communication studies. An increasingly globalised world means that public spheres are becoming more multilingual, more multicultural. It means that people can participate in public life by speaking a language different from their ‘native’ one, or if that’s not possible, use the medium of translation or interpreting. If you ask me, this has always been the case but it has been largely bracketed, to use Nancy Fraser‘s term. So what do we see today? A rise in the use of “minority languages” in citizen debates, such as Polish, Urdu or BSL in Britain, for example. With the exception of BSL, these are sometimes called migrant languages, to distinguish them from so-called heritage languages that are also gaining popularity once again, such as Gaelic in Scotland, Breze in Brittany, Cornish in Cornwall etc. I use the terms minority, migrant and heritage languages with caution, as these eventually overlap and their definitions are a bit fuzzy. The point is, multilingualism in political debate is a hard fact and it is here to stay. The practical issue here, of course, is that historically, common languages (linguae francae) were used for convenience, so there was always a dominant language used in everyday discussions and in national parliaments. But think of national parliaments in Switzerland, Belgium, Canada. In the EU Parliament, interpreters are used and any cases of miscommunication are similar to ones that occur in monolingual environments anyway. A lingua franca is not always the most practical solution. And that is not necessarily a bad thing. Because if we think of the gatekeeping issue, if we impose a lingua franca we are immediately excluding those citizens and taxpayers who choose to speak their own migrant, minority or heritage language, whatever you want to call it. And there are enough exclusions already, don’t you think? When we speak a different language, we essentially become different people. When we think in a different language, we think in a different way. Languages represent cultures, belief systems, lifeworlds. If we switch to a different language, we switch to a different worldview. Forcing people to speak the same language especially in political debate is to force them to think differently and to have different arguments. Some people consider it as a form of oppression. Who is to say that English in Britain, French in France etc. is the only accepted language of critical-rational debate? It is arrogant to think that one dominant language is the language of reason and the sole purveyor of truth. This is why we need to embrace multilingualism, we need to foster and encourage it, especially in politics, where it is most vital. It encourages pluralism in thought and expression, which is at the heart of democracy. A few weeks back I uploaded some information on the upcoming round of WorkGroup Meetings as part of the COST EU Action on “New Speakers in a Multilingual Europe“. The meetings which will be held at Heriot-Watt between 6-7 March 2014. The project involves researchers from some 17 European countries. In the project we are interested in finding out more about what it means to become a ‘new speaker’ of language in the context of a multilingual Europe. One of the multilingual strands we are exploring is indigenous minority languages and what it means to become a new speaker of languages such as Irish, Gaelic, Welsh, Galician, Catalan etc. As a new speaker of Irish, I have been intrigued by this growing phenomenon in the case of the Irish language. I am also a new speaker or neofalante of Galician, a language spoken in northern Spain. I have also begun to pick up a smattering of Scottish Gaelic since my move over to Edinburgh. I’ll leave my observations on Galician and Scottish Gaelic for another blog post and focus on new speakers of Irish for now and a project on which I am now working on jointly with Dr John Walsh at the National University of Ireland, Galway. Becoming a new speaker of a minority language requires commitment and dedication. The new speakers I interviewed during my field trips back to Ireland had clearly invested a lot of time in learning the intricacies of the language. In the early years after political independence in Ireland, there was a strong link between national identity and the Irish language. But new speakers of Irish in 21st century Ireland are no longer speaking Irish for patriotism. In the globalized world in which we now live, becoming a speaker of a minority language such as Irish is about standing out and being different. As one of the new speakers I spoke to way back Dublin in 2003 told me “I think that I am very proud that I can speak Irish .. .I like that side of it you know like when other people think about you or ‘she has Irish’…. so like I stand out because of Irish and I like that…” (O’Rourke 2005: 294). While the Irish language was for a time tainted by the association of nationalism with political violence in Northern Ireland, for a lot of young people now, being a new speaker of Irish is more about tolerance and recognition of diversity. New speakers bring with them new ways of speaking the language – they often mix Irish with English, they make up new words, use the language in creative ways and often speak with an urban accent. The term ‘Dublin Irish’ was used by some of the new speakers I spoke to refer to their own way of speaking. These new speakers are bringing Irish into new contexts, ranging from hip-hop music to playful use of the language in internet chat rooms. So instead of drawing on an Irish of the past, they are inventing and re-inventing an Irish of the future. The recent resignation of the Irish-language commissioner in Ireland, Seán Ó Cuirreáin, featured strongly in the Irish media just before Christmas. Irish is the official language of the Republic of Ireland. It is one of the only minority languages in Europe and perhaps in the world to have this level of official status. However, despite this apparent protection at institutional level, there has been a very laissez-faire attitude to the language. It is little wonder that the Irish-language commissioner accused the Irish Government of hypocrisy, and said Irish speakers in traditional heartland areas of the Gaeltacht (meaning Irish-speaking) were being neglected. But the Irish language, like many of Europe’s other minority languages, including Scottish Gaelic, Welsh, Basque, Breton, Catalan, Corsican, Galician, Occitan, Sami, Romani, Yiddish etc., is being embraced by new speakers. New speakers are individuals who were not brought up speaking the language in the home as “native” speakers but who learned it as a second language outside of the home, either at school, through adult classes or some other formal means. Followers of the blog will remember a post on the concept a few years back inviting people to our symposium New Speakers of Minority Languages: A Dialogue. This is an exciting moment for Irish and others minority languages which are now being used in modern and new contexts. I am currently coordinating an EU-funded COST project on the theme, ‘New Speakers in a Multilingual Europe’ involving researchers from some 17 European countries. As part of the project, some of my European colleagues and I are interested in finding out more about what it means to become a new speaker of a minority language such as Irish, Gaelic or Welsh. ▪ Why do people decide to invest time and effort in learning a minority language? ▪ What are their experiences of speaking these languages? ▪ Who are these people? This year, the 46th Annual conference of the British Association of Applied Linguistics (BAAL) will take place at Heriot-Watt University, Edinburgh from 5 – 7 September. The event is organised by the Department of Languages and Intercultural Studies (LINCS) with Dr Bernadette O’Rourke as principal organiser. The local organising committee includes Ms. Rita McDade, Professor Máiréad Nic Craith, Professor Graham Turner, Professor Isabelle Perez, Ms. Elizabeth Thoday, Mr John Cleary, Ms Emma Guion Akdag, Dr Michelle Liao, Mr Ashvin Devasundaram, and Mr Anik Nandi. BAAL dates back to 1965, and since then it has received encouragement from the leading linguistics scholars in Great Britain including: James Britton, Michael Halliday, Glyn Lewis, Donald Riddy, Frank Palmer, George Perren, David Stern, Peter Strevens, John Trim, and Jean Ure among others. Over the last few decades, research in the area of applied linguistics has been transformed by an increasing focus on socio-cultural and linguistic change. This adjustment has accompanied increasing globalisation, mobility and human migration alongside new technologies and a shifting political and economic landscape. This year, the conference theme: ‘Opening New Lines of Communication in Applied Linguistics’ addresses the challenges and opportunities these developments present.